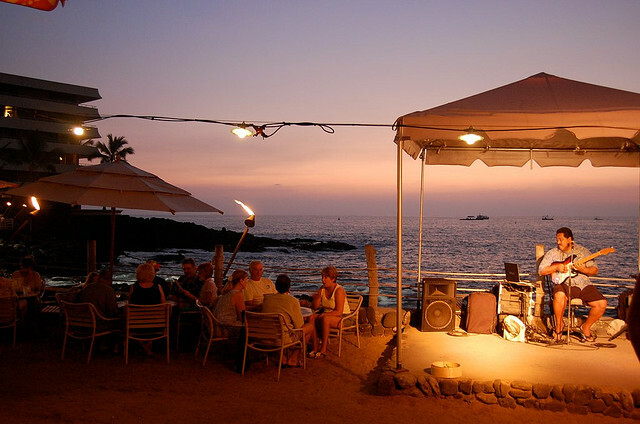 Opened in 1998 in the waterfront location adjacent to Huggo’s fine dining restaurant, On the Rocks is a come as you are, kau kau (eat) great food with sand between your toes, kick back and enjoy great island entertainment center of fun on Hawaii Island. “After operating Huggo’s restaurant for 18 years, we had the opportunity to purchase the vacant lot right next door and we jumped at it,” Eric says. Open for lunch and dinner daily, our On the Rocks menu focuses on more casual dining options with an emphasis on island fresh foods, refreshing tropical libations; the vibe is fun and relaxed – a place for good friends and families to create memories together. “We’ve been fortunate to assemble an outstanding staff and stellar roster of local musicians and dancers over the years, and today we welcome locals back nightly, as well as guests from around the world,” he says. Sharing the relaxed island lifestyle with aloha is what we’re all about – along with great drinks and island foods, of course!